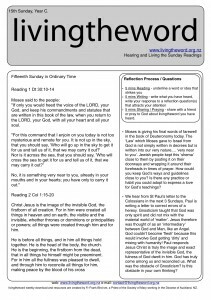 5th Sunday Easter – do people know you are a disciple? Paul and Barnabas traveled great distances, endured resistance and persecution and spent years away from their ʻhome baseʼ of Antioch. On finishing their ʻjourneyʼ they returned back through the various towns – even those that persecuted them! What does this teach you about Paul and Barnabas? What would ʻtheirʼ missionary journey look like in ʻyourʼ world, office or workplace? Paul and Barnabas broke centuries old prejudices of considering God only loved ʻthe Jewsʼ. His ʻchosenʼ. Going to the Gentiles was an enormous change. To put this into context, if a Jew married a Gentile in Jesusʼ time the Jewish family would conduct a public funeral to say to everyone that you were now ʻdeadʼ to the family. Gentiles were considered ʻintrinsically uncleanʼ. Strict Jews believed they were ʻdefiledʼ by being with Gentiles. Which group of people today are considered ʻoutcastsʼ, ʻsinnersʼ, beyond Godʼs love? Could you be a missionary to them? What might need to change in you? In the Church? The Book of Revelation gives us the final seventh vision. Although Jerusalem had been destroyed and Christians were being severely persecuted a vision is seen of what will come true. Can you look at the Church today – in its current struggles – and see the bride (church) adorned for her husband (Christ) and Godʼs presence ever dwelling in the Church in the Eucharist and the Word? In Johnʼs gospel the moment of Jesus dying on the cross is not simply a place of suffering. The word Glory is used 5 times in todays gospel. It is Jesus being ʻlifted upʼ like a winning coach on the shoulders of the winning sports team. It is a moment of victory. Glorious! When you look at the cross, do you see only suffering? Can you see why it is also ʻgloriousʼ? Jesus gives a commandment to his disciples which is ʻnewʼ. While the Old Testament encouraged Jews to ʻloveʼ their neighbour, it was interpreted within the boundaries of your ʻinner circleʼ of family. Jesus tells his disciples the love his followers are to show is to be qualitatively different. A self sacrificing love to all like his own love on the cross. A love to ʻoutsidersʼ not simply ʻinsidersʼ. Would people see in your lifestyle and ʻloveʼstyle something different? Can you identify a lived action where you lived and showed Christ recently? The early Christian community described in Acts endures many challenging experiences. Today marks an incredible ‘break-through’. Greek speaking (Hellenists) Christians complained their widows were not being fed in the daily distribution of food to the poor. Jewish Christians may have been favouring their own kind. The Church was transitioning from a Jewish Christian community to a more Greek speaking and Greek cultured community. Imagine the tensions and arguments! Yet the Apostles creatively responded with wisdom and preserved unity. A new service structure was implemented into the community. Who is getting all the attention in your community? Who is not? What creative response is needed to meet the needs of ‘the poor’? The passage of scripture from Peter is regarded as part of an Easter Baptismal Homily. The image is of a Temple built with stones aligned with the ‘cornerstone – Jesus’ which holds the whole ‘house’ together. Who is a ‘living stone’ you look to in your local community for ‘alignment’ with Jesus? 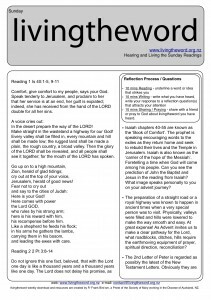 How do you ‘measure up’? Priesthood, a Holy People set apart, a people bringing the world to God and God to the world, is not to be understood as confined to the ‘Temple’. Peter reminds all the baptised they are no longer limited to bringing animal and grain offerings to the Temple. Their lives are to announce God’s love and care. Feeding the poor, clothing and care of the sick, prayers for the community are all part of the great ‘spiritual sacrifices’ offered to God to bring God to the people and the people to God. Do you glimpse your ‘royal’ and ‘priestly’ job description of Baptism into the family of Christ? Can you glimpse the connection between the Sunday altar and the Monday office desk? John 14-17 is Jesus’ departing words to his disciples. His words are filled with the language of intimate love. Have you ever had someone beautifully prepare a guest room for you? Say they want you to be always with them? How did it feel? How does it feel to know Jesus wants this relationship with you? Without Jesus and no longer welcome in the Jewish Temple, the Johannine community felt they were lost. ‘How can we know the ‘way’? ‘I AM the way’ is a theological punch. Jesus uses the ‘divine name (I AM) and challenges his followers to live ‘his way – the way of God’. Our life-style, our time-style, our ‘way’, is to be in exact replication of Christ. How does this challenge you? “Going to Church doesn’t make you a Christian any more than standing in a garage makes you a car.” What ‘works’ are we called to do? The church continues for 8 weeks soaking us with the message and stories of Easter. Consider the story of the newly married Catholic German couple. The wife welcomed fleeing Jews into their house for safety. The husband on returning challenges his wife on their own safety and possible death. She replies: but we believe in the resurrection. Is your heart glad? Tongue exulting? Flesh hopeful? Peter with the ‘Eleven’ standing in the midst of many ‘Jews’ is a picture of the early Church in Jerusalem. Considering the tone of their words and the audience, fear of persecution is heavily present behind the scenes. Picture yourself today, in the Church, one of the ‘eleven’. What are the challenges and obstacles of the christian community today? The Holy Spirit moved the disciples from fear behind closed doors to courage and preaching in public places. Do you sense the Holy Spirit moving and inspiring you toward a certain action, attitude, mission task? The word ‘ransom’ has a special history in the Old Testament. If a member of your family was sold as a slave, imprisoned, or family land was in-debt, the eldest member of the family had a special duty to ‘ransom’ (buy-back) the family member or land. This image is used by Peter. We have not been won back to God by gold but ‘with the precious blood of Christ’. Do you glimpse the cost of God wanting us to know we are ‘reconciled’ with him? Do you glimpse how loved and loveable you are? What is your life-style response? The Road to Emmaus features disciples so upset and downcast. They had such high hopes in Jesus. They now ‘walk away’ from Jerusalem. They could not understand why the death of Jesus was necessary. Their saviour had become a failure. To understand they need to be shocked and humbled at how God’s power is able to work through human weakness. Are you ‘walking away’ from Easter / Jerusalem disappointed? Do you ‘see’? In the Church’s liturgy what was present in Christ has now passed over into the mysteries / sacraments. Past events are truly made present now. The Emmaus story reflects this truth. Jesus is truly present when his words are shared and his actions at table are repeated. When he ‘blessed, broke, gave’ bread were very very important to the community. These particular actions and words were unique to him and were commanded to be repeated. How could you heart burn more with scripture? What do you need so that you may ‘recognise him’ in the celebration of the Eucharist? The Book of Revelation gives us the final seventh vision. Although Jerusalem had been destroyed and Christians were being severely persecuted a vision is seen of what will come true. Can you look at the Church today – in its current struggles – and see the bride (church) adorned for her husband (Christ) and Godʼs presence ever-dwelling in the Church in the Eucharist and the Word? Feast of Ascension, Yr B – looking up or looking around? The writer of the Gospel of Luke is also understood to have written the Acts of the Apostles. In Acts, we learn of the unfolding events after Easter. The Feast of the Ascension is not trying to claim historically after 40 days Jesus ‘ascended’ but simply reflect on his ‘Ascension’ and new presence now in Heaven. Jesus states a promise has been made by the ‘Father’ to send the Holy Spirit. Have you ever asked someone to make a ‘promise’? Why? What does this reveal about Jesus and ‘us’? The disciples are almost ‘told off’ by the Angels. ‘Why are you looking up at the sky?’ Instead of looking up, look around and get to work. The text also encourages a waiting for the spirit and its power so that each disciple can ‘witness’. Have you ‘waited in prayer’ calling for the gift and promise of the Holy Spirit? Consider how you could enter deeply into this prayer request leading to the celebration of Pentecost next week? Consider a place and time. The Spirit is often given through other people’s prayer. Who could you ask? Paul teaches beautifully about the deeper reality of ‘Church’. Rather than a mere ‘building’ Paul reminds us our identity and mission is to be the ‘body of Christ’. It will take plenty of work to present to the world a community ‘fully mature’ and with the ‘full stature’ of Christ. What virtue do you think you could live more intentionally at home / work / Church? Humility. Gentleness. Patience. Bearing with one another. Preserving unity? The Gospel of Mark is the earliest gospel and was written in a time when the early disciples still thought the return of Christ would be soon. The urgency to share the gospel with every creature before the return of Jesus can almost be felt in the text. This mission is still an active job description to us by Jesus. Imagine having such a wonderful message that you know will bring people joy and life. As you prepare to share it, would you consider just how the message would be received, what obstacles may be in the way, so that they truly ‘get it’ when you speak. St Francis of Assisi told his followers ‘Preach the gospel to the whole world, and you words when necessary’. Do you witness more by words or example? How could you try the other option? Mark uses dramatic language to highlight the truth that the power of the Holy Spirit is truly at work in the lives of disciples and in ‘signs’ that accompany the ‘words’. The image is of an intimate connection between Jesus in heaven and his disciples preaching. 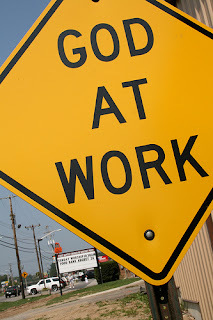 What signs would you like to pray for on your journey at the moment. Reflection question 3; Paul and Barnabas broke centuries old prejudices of considering God only loved ‘the Jews’. His ‘chosen’. Going to the Gentiles was an enormous change. To put this into context, if a Jew married a Gentile in Jesus’ time the Jewish family would conduct a public funeral to say to everyone that you were now ‘dead’ to the family. Gentiles were considered ‘intrinsically unclean’. Strict Jews believed they were ‘defiled’ by being with Gentiles. Which group of people today are considered ‘outcasts’, ‘sinners’, beyond God’s love? Could you be a missionary to them? What might need to change in you? In the church? 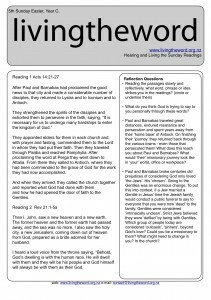 Resource highlight – as well as many resources check out also the google bookshelf created for livingtheword. On this bookshelf are a few well chosen books that can help you investigate and study the scripture readings yourself. Enjoy!